Note: If you landed on this post, please note that there is an updated post that has everything you need to know about the new TIMELINE Format for Facebook. Please click on this link to check out Timeline for Facebook Pages: The Complete Guide. These three things are all important aspects of becoming a successful blogger, as you probably already know. I tried to look for posts from the big time bloggers specifically about Facebook and how one could utilize it for their blog, and if it was even worth it. Well, I couldn’t find any definite answers, so I figured I’d just do it myself, see what happens, and report my findings back here for you. That’s kind of what I usually do on this blog. Anyways, the following is a compilation of what I’ve learned, which I hope many of you can use as a guide if you’re at all interested in using Facebook for something useful other than poking your old high school friends, or showing off your latest Bejeweled Blitz scores and Farmville achievements. It has an Alexa ranking of 2, just behind Google. So, what’s in it for us bloggers? Can we benefit from this rapid expansion into the Facebook platform? I say absolutely, and I have some initial data to prove it. Probably the most notable part of this data is that the traffic from Facebook included those with the most pageviews (3.25), the most average time spent on the site (05:14), and the lowest bounce rate (49.55%), and by a significant amount too. As time goes on, I expect my traffic to increase, and I’ll make sure to keep a close eye on what happens and report back to you. So far, I’m fairly convinced. If not for the quantity of traffic, at least for the quality. Now, realize that in a perfect world, I would have 1000 Facebook accounts and methods in place to control variables that could have an impact on my data (not to mention, more time) but of course that can’t happen. You can interpret these numbers however you wish, but honestly you won’t know what Facebook can do for you unless you give it a shot yourself. 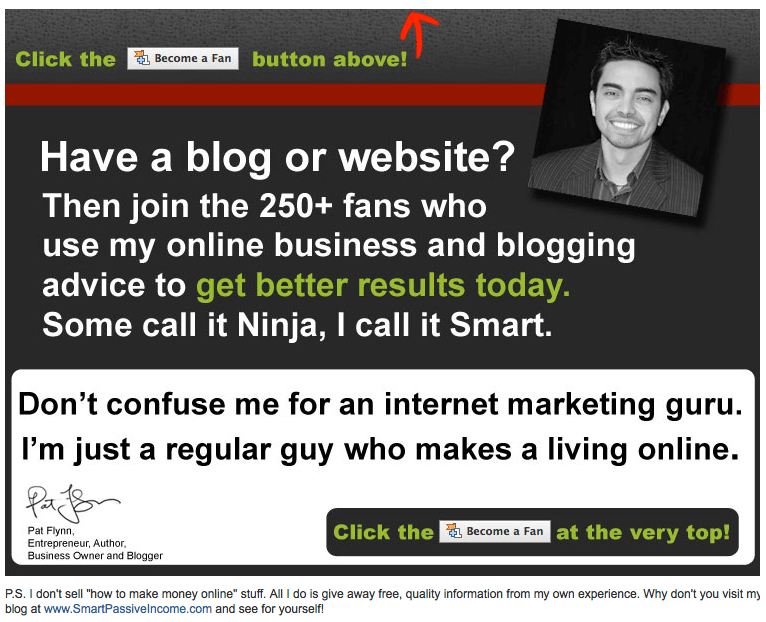 Getting on Facebook is NOT a “Magic Button” for your blog. I’d be weary of anything that claims to be just that. It does take time and it’s another platform you’ll have to “deal with”, but Facebook might be one that you don’t want to miss out on. Your personal profile is basically your primary account, where you can interact with friends and family. You may wish to just use your personal profile to advance your blog (which many people do), but knowing that you’re going to have to talk about whatever niche your blog is about from time to time, understand that this may end up annoying your friends and family who really just want to see pictures of you passed out in Vegas. For this reason, you may want to consider creating a Group or a Page for your blog, to keep things quasi-separate. Because of this, I created a Page for the SPI Blog. It works JUST like a personal profile, so it was easy for me to get used to, and the interaction with my fans (friends for Pages are called “fans”), has been quite good. You can’t convert between Pages and Groups once you’ve made your choice, at least not at the moment, so choose wisely. The rest of this post will be primarily geared towards Pages, not Groups. Here’s a video about how to create a Facebook Fan Page. Here are a few important things to consider when creating your Page. 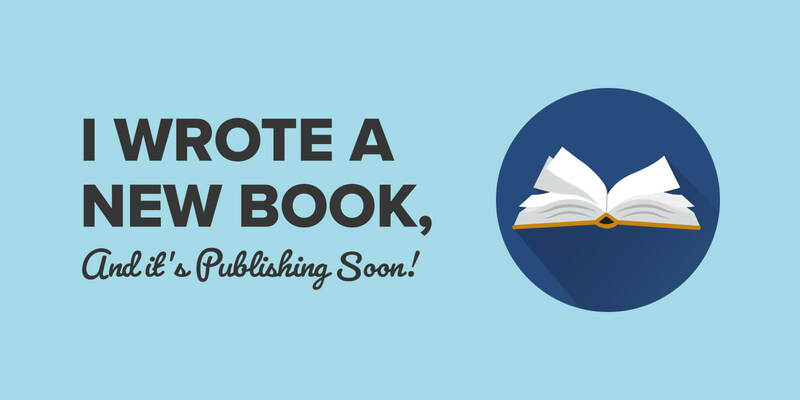 Put Some Thought Into the Name Of Your Page: Once it’s created, you can’t change it back. 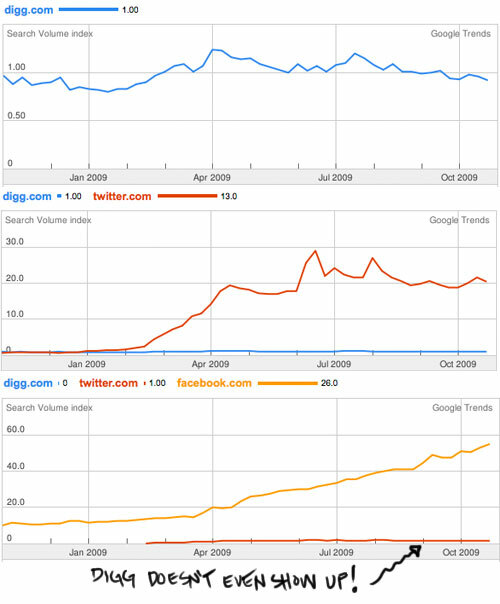 Also, Facebook Pages get picked up by Google, so keep that in mind. 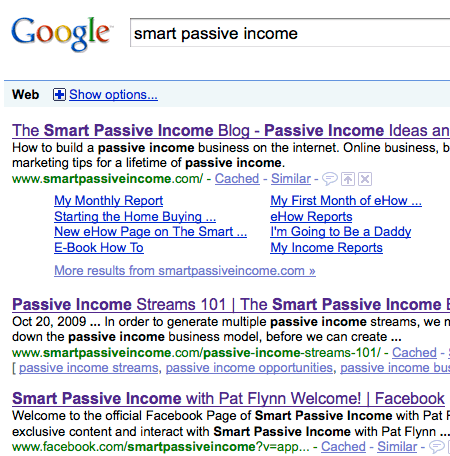 My Facebook Page for SPI is ranked #3 in Google for “Smart Passive Income”, for example. Are You Going to Upload a Logo, or a Picture of You? : It’s really up to you, but think about this: if you were a fan of a website or a blog, which would you rather interact with? A logo, or the actual person you’re engaging in conversation with? Send Out Status Updates Before You Try and Get Fans: Why? Because you won’t get any fans if you have a blank wall. At least mention how stoked you are to finally have your Page setup, or how excited you are to talk to your fans in the near future. Change the URL of Your Page So It’s Easier to Work With: It’s a lot easier to say, “check out facebook.com/smartpassiveincome”, instead of “check out facebook.com/awdoihaiwduh82320983o4h3 or whatever the url ends up being. You can customize it by going to http://www.facebook.com/username. Please note that you can only do this once you have at least 25 fans. Again, put some thought into the customized URL. Most likely, the same address as your blog will be your best option. This is THE most important part of this whole guide. If there’s one thing you take away from this post, this is it. In order to convert people who head over to your Page into fans, you must use a landing page. Without it, new visitors will be taken straight to your wall, which is ugly and doesn’t really tell people exactly what to do. They’ll see all of these conversations going on, links and pictures everywhere and they’ll probably end up leaving because they have no clue what to do, or what’s in it for them to become a fan. I could probably do more with the copy and the design, but after 3 versions of the landing page, this one seems to convert the best for me. Besides that, which of the two do you think converted more fans? The second one, by a landslide. Lastly, if you want to use the “become a fan” button that Facebook uses in your landing page copy, you can just right click and save the .png file below. 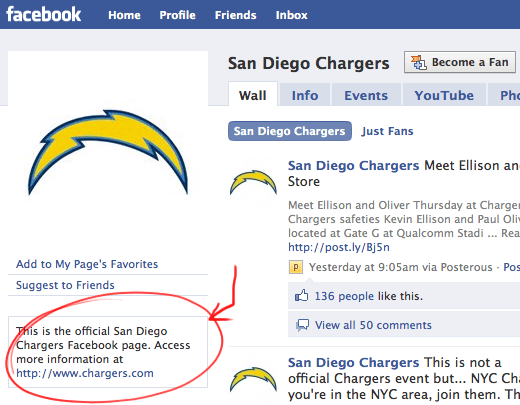 UPDATE (4/20/10): Facebook has changed the “Become a Fan” button to a “Like” button. This isn’t to be confused for the “like” that you can click under a friend’s comment, picture or link. I don’t know why they used the same terminology to replace “become a fan”, but that’s just the way it is I guess. So, when you visit a Business Page that you haven’t “liked” yet, you’ll see this button below, which you can borrow for your own landing pages that you create too. Place a Link to Your Page on Your Blog: You can place a link to your fan page on your blog either in the area where you also have an RSS button, or at the bottom of your posts, where readers are more likely to engage with you after reading your content. Place a Link to Your Page in any Forum Signatures You Have: Make sure to take advantage of your presence on forums related to your niche by placing a link to your Page in your signature, so it’s done automatically for you after each of your posts. Take advantage of html to make a nice looking anchor text (preferably with a call to action), back to your Facebook Page. Advertising Your Page on Faceboook: It does cost money, but you can get highly-targeted followers to your Page and blog by advertising with Facebook. Your blog is where you eventually want everyone to end up, so you want to make sure you provide enough opportunity for your Facebook fans to click on over. Static links are links to your blog on your Facebook page that are not part of the conversations and interactions going on. There are a few opportunities to place links right on your wall for everyone to see. 1. Inside the “Info” tab there’s a spot for your website address. Links in the “overview” area will not be clickable. 2.  On your main page, right underneath your profile picture, there’s a perfect spot for a quick intro and a link back to your blog. Just hover over this spot to edit. 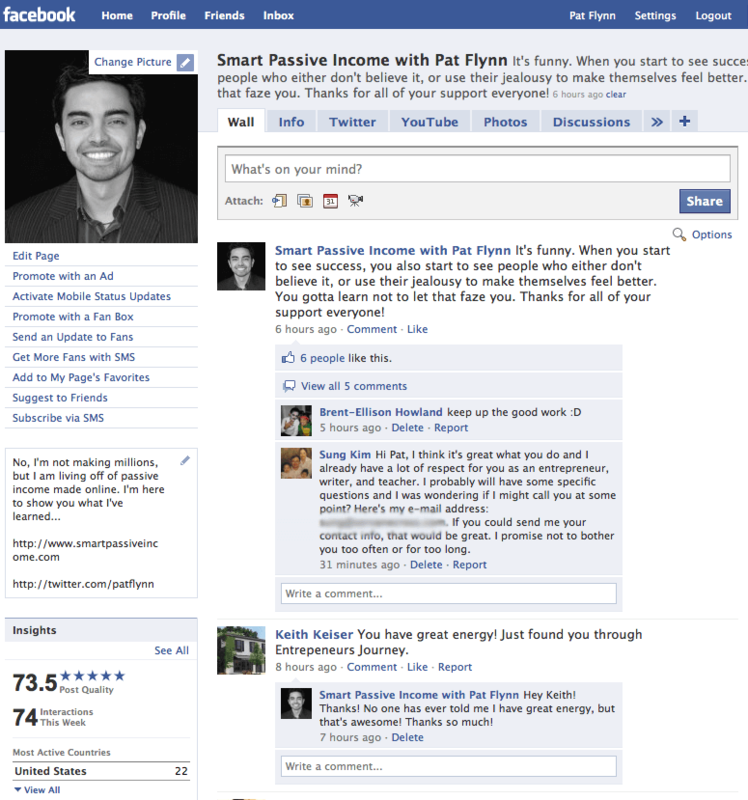 The more exciting way to get traffic to your blog from Facebook is to share a link with your fans via your wall. This way, it will be shown on every one of your fan’s personal news feeds. You can also share videos, pictures and events in the same manner. Besides a “broadcast” to all of your fans, you can insert links within the conversions that are already going on on your wall. If you want, you can use your favorite url shortener to make them look nicer if they are too long, and you can track how many clicks you get at the same time. Personally, I like to use bit.ly. As with anything that involves you wanting to get people to click something, your copy will have a lot to do with how many people actually click on the link. 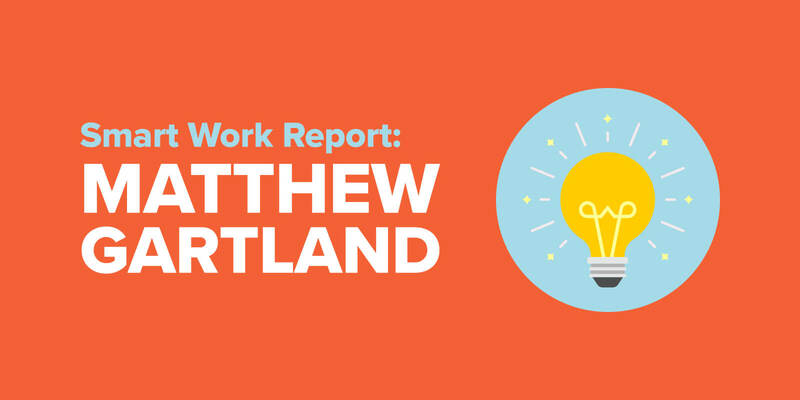 Test out different ways to present information to your Fans, and I’m sure you’ll find a way that works best for you. Oh, and as always – spamming is bad. Go easy with your links, but don’t feel like you aren’t allowed to post any links at all either. There are many other applications on Facebook that Pages can utilize (Groups cannot utilize applications at the moment). For example, you can setup an RSS feed tab, which immediately pulls the latest blog posts from your blog’s RSS feed and places that into your Page. The same goes with YouTube and Twitter, and I’m sure all of the other social networking and bookmarking websites as well. Only a limited number of tabs show up on your Page (the rest are hidden, but can still be accessed), so you’ll have to choose your primary tabs carefully, although they can be rearranged later. Personally, I have a Twitter and YouTube Tab on my Page, as you can see below. 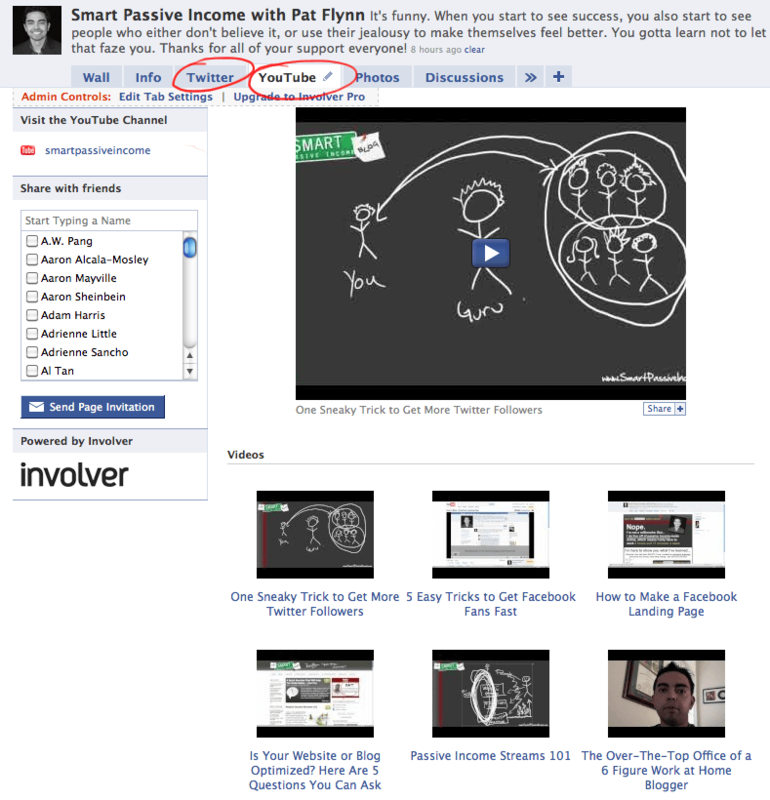 Involver.com is a company that does complete brand marketing for companies on Facebook. They have a number of different applications you can choose from for your Facebook Page, and the first two you use are free. After that, you’ll have to pay. It’s hard to choose because there are so many cool applications you can use for your blog, such as a twitter feed, RSS feed, YouTube channel, Flickr, Slides, PDFs, file sharing, and more. My advice to you: choose wisely. There are a number of things you can do on your blog itself to optimize your Facebook experience. You can create what is called a “Fan Box”. A Fan Box is a widget that you can display on your blog that shows either your latest updates, pictures of your fans, or both at the same time. On the right hand side of my blog, you can see my personal fan box. On your blog posts, you can insert a button that will share your post to the friends on Facebook of whoever clicks on it. It’s sort of like the Tweetmeme / Retweet button, which you can see at the top of this post on the left hand side. I have yet to try this out, but I might incorporate it into my next design. As far as this kind of “push-button sharing” is concerned, more people are using Twitter instead of Facebook, at least for now. Well, that was a super long post, but I think it should give you a good start with getting used to Facebook and how to leverage it specifically for your blog. Until next time! I wish you nothing less than success! Cheers! p.s. If you found this post useful, please share it on twitter by clicking the button below, and as always, you can subscribe to the blog by clicking here. Thanks!